Learning about different cultures The Grade 2 and 3 Enrichment group enjoyed learning about Chinese New Year. They made Chinese dragons and had great fun creating a dragon dance! Horse Riding Riders from Beaconhurst school enjoyed watching a giraffe from horseback and had a fun cooling off session in the dam. Reduce Reuse Recycle The Beaconhurst Eco Club learned about the dangers of pollution and how everyone can make a difference by recycling. 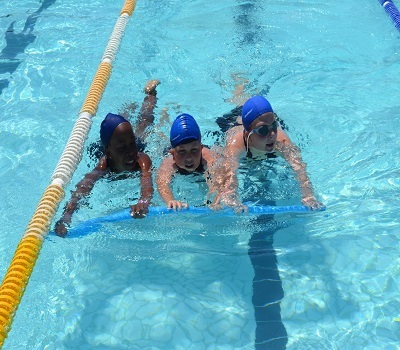 This was followed by fun group challenges in the pool. World read aloud day The grade 3s at Beaconhurst celebrated World Read Aloud Day recently by reading to the younger grades. A drop of relief Beaconhurst collected water to be sent to drought stricken Cape Town. Bukhazi Mtshizana, in Grade 1 donated 11 bottles of 5L water!